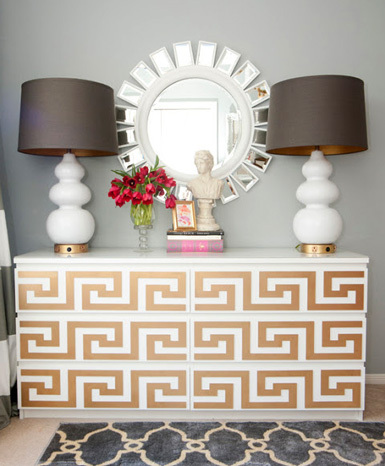 I stumbled upon the fabulous greek key chest (below) and discovered it was a fairly easy DIY makeover using an incredible product called O'verlays to glam up an IKEA Malm dresser. Have you heard of this company before? I hadn't until yesterday and absolutely love the concept and idea behind these simple overlays. Created by friends Danika and Cheryl, they launched a line of overlay designs in a lightweight composite material that allowed greater flexibility and less splintering, an issue with the original vintage balsa wood panels. They also made sure the product could be paintable to allow for endless looks. Everything is compatible with specific IKEA furniture pieces but you can also use them for any old furniture that needs some sprucing up! 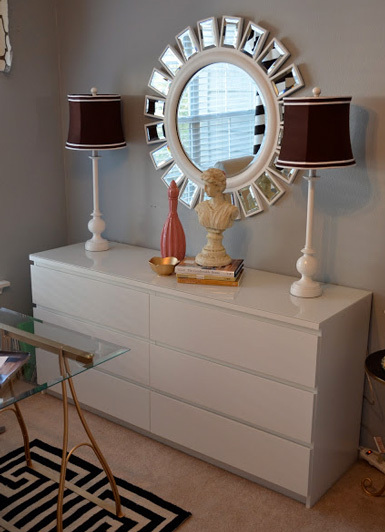 Here's a look at a few makeovers that have inspired me to want to redo some of my own furniture! What do you think about O'verlays? Have you used them before? For more amazing DIY projects, visit the O'verlay blog! 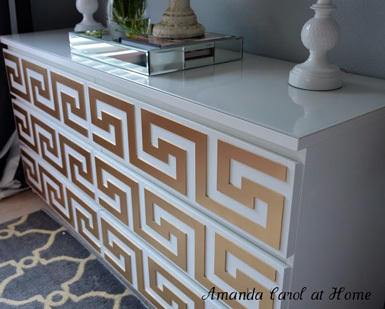 This IKEA Malm dresser was completely transformed by using the Greek Key Fret design from O'verlays, which were spray painted gold. Click here for details on how Amanda transformed this piece! 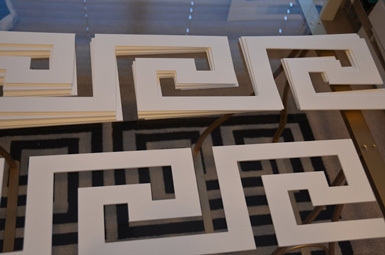 I found this awesome DIY transformation over on the blog Sanity Affair, where a $70 IKEA shelving unit was painted white and embellished with these fun Greek Key corners from O'verlays. How amazing, right? Click here for the complete step-by-step project. 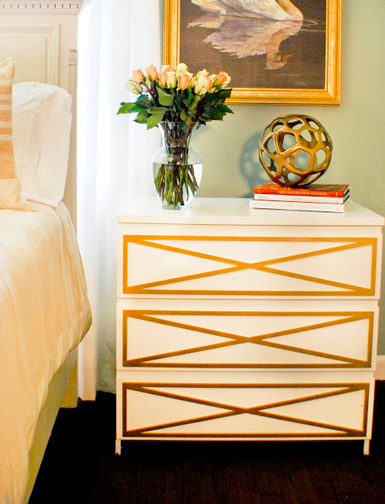 Gold painted overlays dress up this simple white chest. Details found on the O'verlay blog. 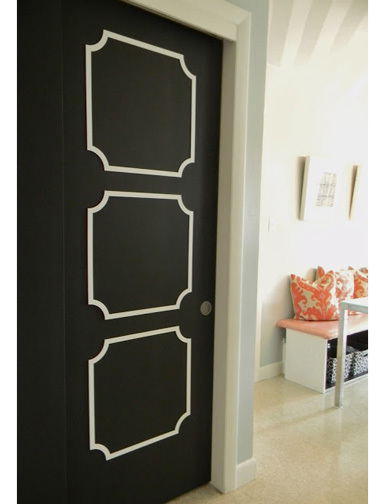 This door was transformed with chalkboard paint and O'verlay's Anne 19" Squares! Details on their blog. Thank you for such a great post! 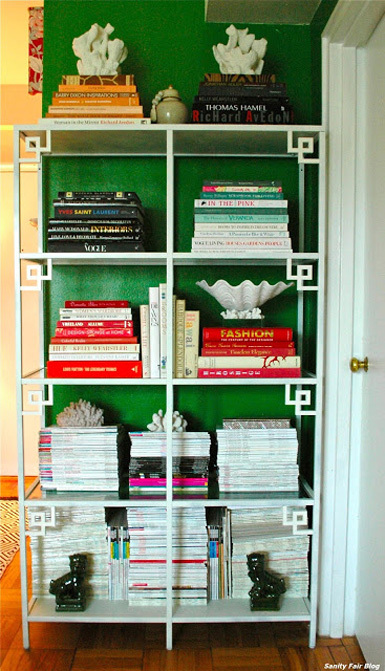 I love the Greek key chest, and the subtle book shelf with the similar design. 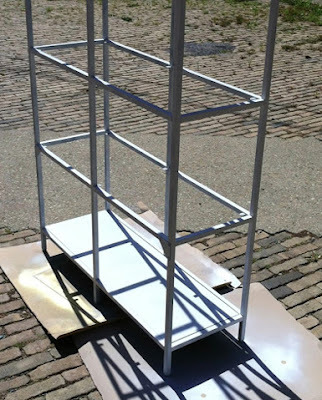 Can't wait to stock up and do some IKEA transforms! This is great upcycling on another level what a great find! Very cool. I'm glad you introduced me to that company. Thank you. If youre interested in the life of a young jewellery designer from Salzburg just check out my blog. 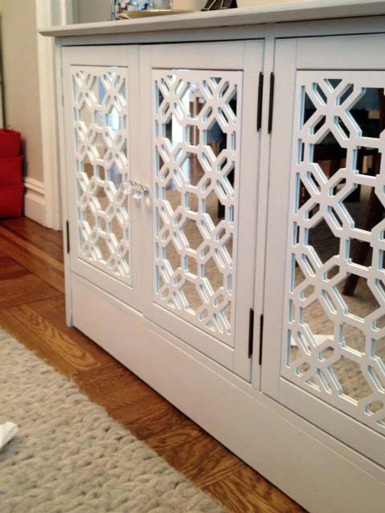 WOW, what a great resource for freshening up an old piece of furniture! I did not know of this company! Such a great idea for a low budget makeover! Thanks! What a gorgeous makeover for your furniture! And it is so budget friendly. How wonderful. I love all the Overlays and have been thinking/scheming of how I can use them! I love the greek key, love the lattic....what to pick!? 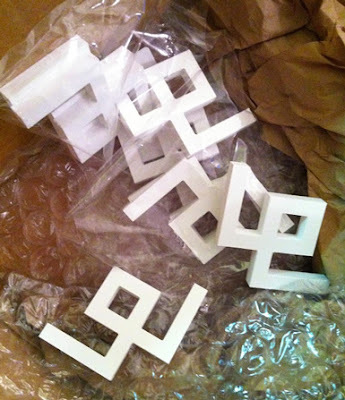 I kinda want to use them on a cornice box for curtains...just to start! I do love the shelving unit and putting them in the corners-I haven't seen that before! thanks Julie:) Hope all is well!